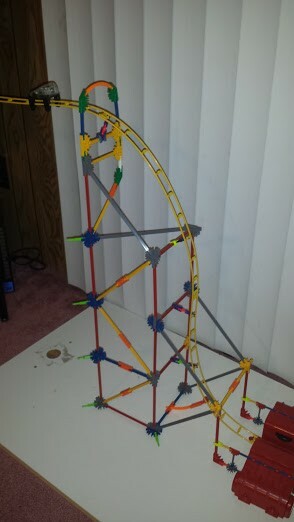 Over the weekend, I found the K’Nex rocket rollercoaster (the big one, in case you’re wondering) at a garage sale for $10. So I bought it. Got a free purse and toy motorcycle out of the deal for my daughter while I was at it, since the rollercoaster was for my son. It took me about six hours to put the stupid thing together. Only to find out the motorized launcher doesn’t have the oomph to get the car up to the top. Plus, even when I get it up there manually, there are places where the wheels or roof hit, causing it to slow down, making it unable to make it through all the little ups. Plus there’s a few gaps in support, so it drooped too much and still wasn’t able to make it up some of the other ups. So I tore it apart yesterday afternoon and sorted out all the pieces so I could find them.